Big news shook the internet on June 18th in Seattle Washington when Jeff Bezos, owner of internet juggernaut Amazon.com, took the stage. The traditionally reserved Jeff Bezos unveiled in a strikingly Apple-esque fashion what can be argued is a significant leap forward for the company and an industry. The Kindle, and then Kindle Fire tablets, have had another distillation into a smaller and more powerful product. The ‘fire phone’ was announced and marks the first entry for Amazon into a dedicated piece of hardware for the smartphone market. What makes the fire phone So Special? The Amazon Fire smartphone has standard features across the board. It has a 4.7 inch screen. A nearly perfect middle child to the Samsung Galaxy s5’s 5.1 inches and the iPhone 5’s 4 inches. The operating system will be a modded version of the Android OS currently used on their Kindle lines with enhancements for their hardware choices. The phone itself will come with a flat set of earbuds and magnetic clip. There will be two sizes, 32GB and 64GB, both of which will have a substandard 720p ( 2380 x 720 pixel resolution ) display. The screen has an unusually high brightness, which still lets you see its glossy screen in the sun. The device is slightly smaller and thinner for it’s screen size than competitors too. Despite having an average processor, it is said to be able to run high end apps due to its OS choice and efficient operation. Like apple iCloud, it is offering users unlimited storage for videos in their Amazon Prime cloud hosting services. What sets this phone apart are both it’s hardware choices and the inevitable connection it will provide to our shopping futures. The Amazon fire will have FOUR forward facing cameras. This double stereoscopic effect will allow the phone to view objects in front of it in 3D. This will create two effects. First it can 3d scan any object in space which allows it to recognize almost anything it views using a database of known models collected by people like you and me who shop on Amazon. This 3D scanner can also allow us to capture movement like a Microsoft kinect or leap motion sensor. This can allow the user to do unique things like ‘peer’ behind apps and other info. True 3D user interfaces will be needed to leverage the full control where your face and where you are looking affect what you are looking at.These devices solve the problem of touch screen finger smudges by removing the need to touch them. Eventually, this will play big into our Augmented Reality future has the devices are used as Markers to project holographic objects over them. Combine with the touch interface and you now have something really special. Subtler implementations will be useable on the current phone. The software in this phone is unsurprisingly a direct tie in to their shopping network. 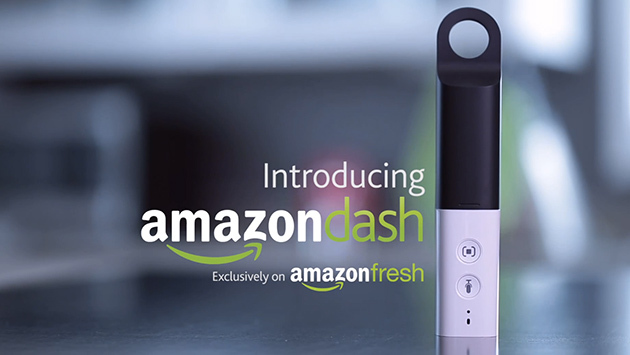 A few months ago Amazon released a product called the dash that allows users to scan any product and order it from amazon. Easy painless restocking and object identification. Sounds a lot like what the new Amazon fire is all about. Do we want a phone from Amazon? This is hard to say. Amazon does one thing very well, keeping costs low while raising the bar for experience and convenience. If the new fire embodies these same concepts, then we can be in for something great. Their low profit margin on shipping and delivery through effective use of monitoring, automation, and robotics has turned them into a world leader in technology. With stunts like quadrocopter delivery turning out to be authentic gestures of their companies future, you can see the edge of Amazon beginning to show. Jeff Bezos has a master plan and this is a step on his journey. We’re just here for the ride. The Kindle has had high success and so has the Kindle Fire while the Amazon fire TV has had mild success . Their e-reader approach has created an entire sustainable niche. What’s more is they have the distribution methods to ensure it takes off. It’s uncommon in this age to see a company with such large verticals of industry. Typical modern business leans toward distributed specialties. Amazon may be a trend back to the big business, or a business so good that not even time can tell it’s time to die. Either way, it will be a great phone which will help the consumers do what they are best at, buying things.